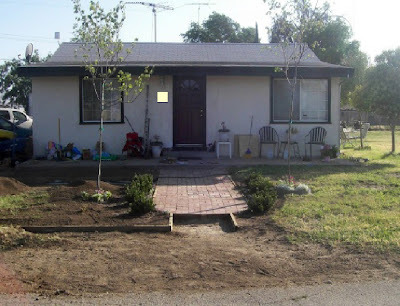 Saturday we got up early and went outside and worked on the yard a bit. Around 11 :30 we all took showers and got ready to go to our friend's house. First we stopped at Costco and got their HUGE chocolate cake and some hot dogs for our contribution. The kids all swam while we sat on the patio and talked. They BBQ'd some ribs and OMG they were so good. Eventually we went in the hot tub although not all at the same time. 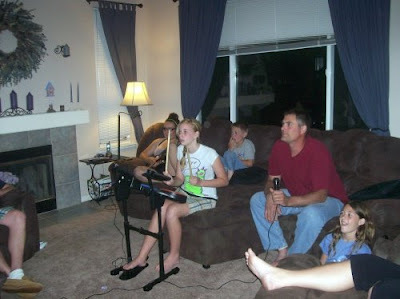 After that we all ended up sitting in the living room while the kids played Guitar Hero and or Rock Band whatever it was lol. They all had a great time and it was fun watching. Before we knew it was 9:00 and time to go home. This morning we got up bright and early and went out and started on the yard again. Maybe some day I won't start a post that way lol. 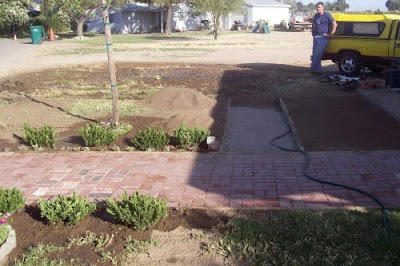 I got the rest of the bushes planted and Scott worked on the new flower bed along the concrete and then the walkway. I helped with that a bit but felt like I was in the way so started working on the big area around the tree a bit more. Here is the end of the day. 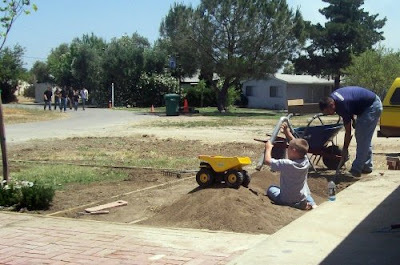 He put what was left of the sand in the walkway, we are going to put that colored rock there, I need to drive down to the landscape place and pick what I want, think I'll get it delivered if it's not too much. looks great!!!!!!!! You have inspired me..if only it turns out that well!! you know, the more walkway you lay, the more shoveling you have to do next winter when it snows! Looks great! It's coming along so great!
" This morning we got up bright and early and went out and started on the yard again. Maybe some day I won't start a post that way lol." 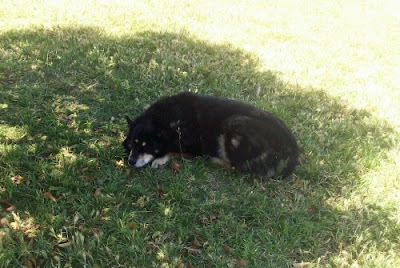 That was funny but like you said..this blog is for you. A journal of what's going on in your life. Start your post however you like. 9:00 is early to be ending the party, huh?